Flowers are blooming, the weather is warmer and hummingbirds are returning to our gardens. Hummingbirds visit our yards looking for nourishment from our gardens and feeders. Many have migrated hundreds to thousands of miles and must eat several times their weight in nectar daily to stay alive. Follow these seven steps to create a hummingbird-friendly habitat in your garden. No yard? No problem. You can still help by creating a container garden on your patio, rooftop, or balcony. Even a window box or hanging basket can help. 1. Fill your space with native, nectar-rich flowering plants including annuals and perennials, vines, shrubs, and trees. 2. Choose red or orange tubular flowers to attract hummingbirds: Salvia, penstemon, and honeysuckle are hummer favorites. 3. Group similar plants together and choose species with different blooming periods so that there will be a steady supply of flowers nearly year round. 4. Leave some sticks and small branches on bushes and trees to enable ready perches for hummingbirds. 5. Eliminate or minimize the use of pesticides in your yard. 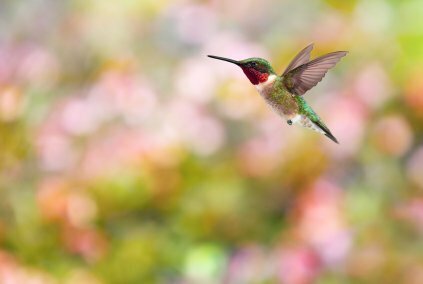 Hummingbirds consume many small insects in addition to nectar, and they as well as butterflies will benefit from a pesticide-free space. 6. Encourage your neighbors to make their yards hummingbird friendly. An entire corridor of habitat is much more valuable than scattered patches. 7. Check out the National Audubon Society’s Plants for Birds database that uses your zip code to find native plants best for your local birds. To learn more fun facts about hummingbirds, what species to expect in our area, and how to photograph these beautiful birds, visit audubon.org.